In middle school, I played trumpet and french horn. Practicing at home was mostly done in the basement at my parents’ request. No resentment was felt but I also didn’t want to be the kind of parent who pushed music behind closed doors. Out in the open so a love for music grows is how we like it in our house. Making space for music at home is important to us. We recently switched things up with our large living room and tiny dining room. The dining room table is now in one half of the living room which opened up lots of possibilities in the dining room. Awkward layout with no full walls but the perfect space for music at home. 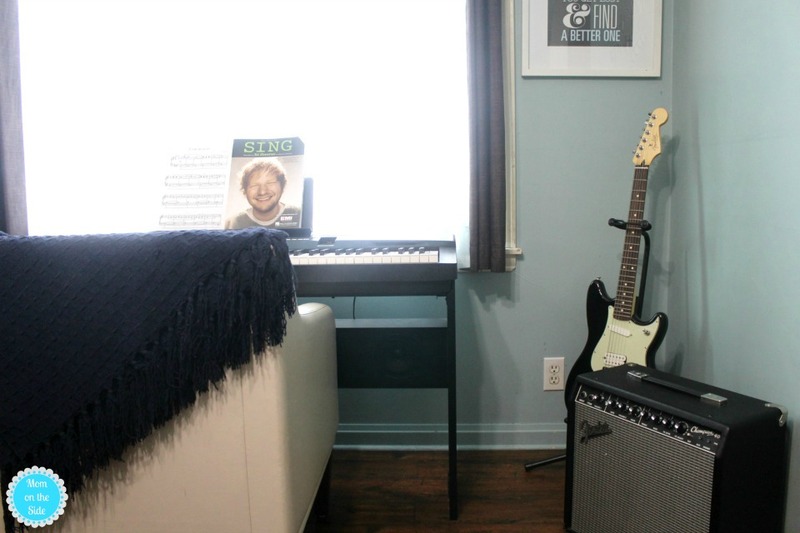 You don’t need a lot of space to encourage music in your home – simply a corner or one wall in a room. Once we knew what we were using the space for it was time to gather up all the instruments. Piano in front of the window, Fender Guitar on it’s new stand in the corner, a basket of the twins toy instruments, and a comfy chair. A comfy chair was a must not only for playing the piano, but also for when the kids bring out their stands to practice clarinet and flute for the school bands. 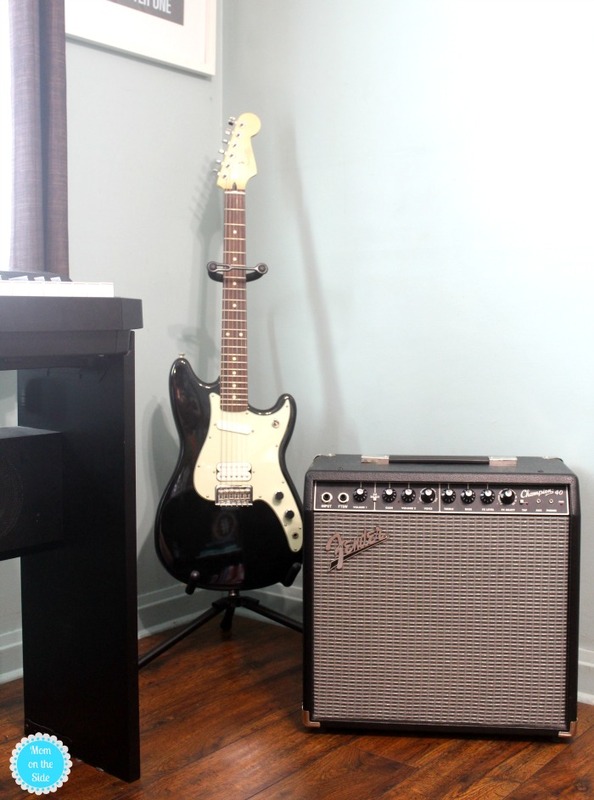 My son claims the chair a lot when he’s using Fender Play to learn guitar at home. 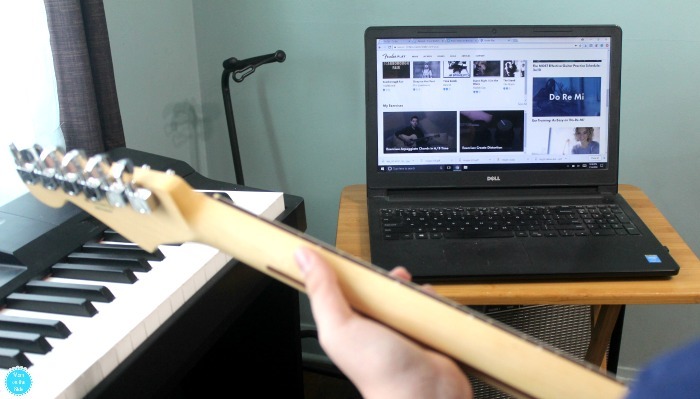 He’s been using Fender Play, a guided online learning program that teaches new guitar players to get playing in minutes, for a few months now. There are hundreds of instructional videos and hands-on exercises that he’s been diving into during his spare time. The curriculum is designed so that after a few short lessons, a player will be able to learn something new, whether it’s a skill, a recognizable riff or a full song which helps keep an 11-year-old interested without frustrating them. 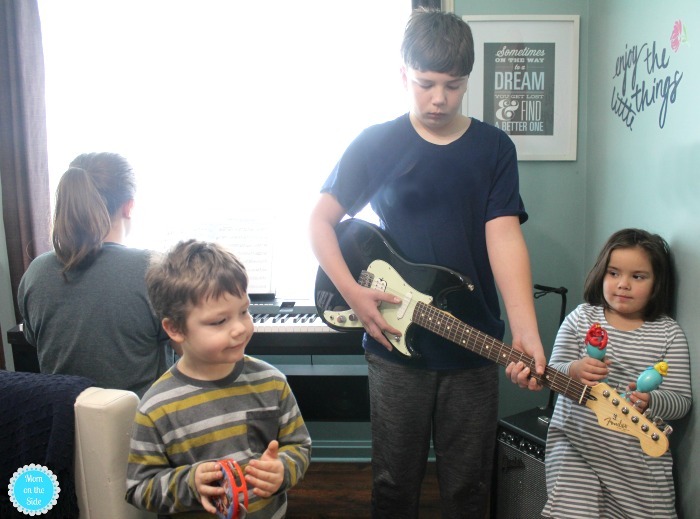 It makes my heart happy to see my son’s enjoyment from playing instruments, especially guitar. Kids who learn guitar do well socially – they’re more confident, develop coordination and math skills, concentration and more. Having this space for music at home has been a great change for us. While our small house allowed me to hear everyone playing wherever they are, this new space brings everyone together into one room. Who knows, maybe next holiday season we’ll have a show to put on for the family! 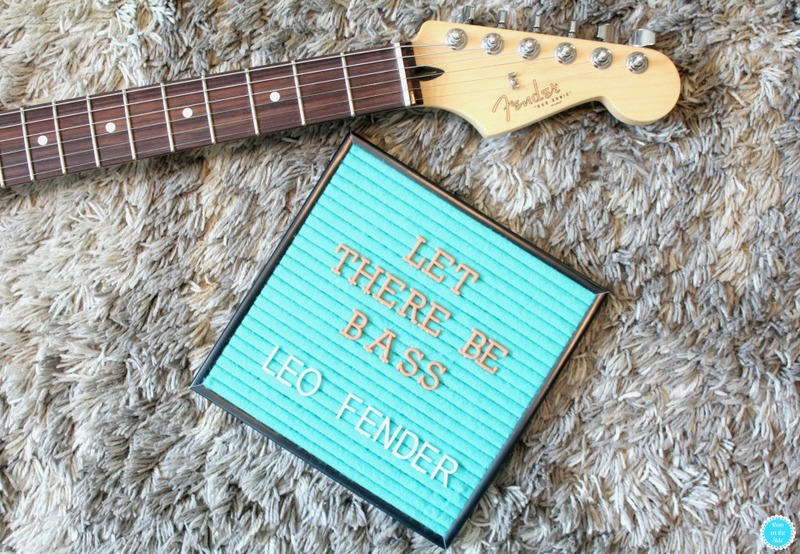 If your kids want to get more into music, Fender Play is a great way to learn guitar because it’s created by curriculum experts and the leading guitar brand. You can start your FREE 30-Day Trial at play.fender.com and experience top-quality 4K multi-camera video production that delivers a clear and unified curriculum. A curriculum which incorporates split-screen and an over-the-shoulder angle for a unique and valuable perspective to new guitar players.